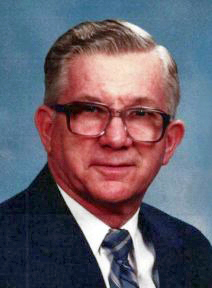 Obituary for Melvin A. Eggimann | McCombs Funeral Home Inc.
Melvin A. Eggimann, 91, formerly of Cape Girardeau passed away Sunday, Nov. 25, 2018 at Legends Assisted Living in Tulsa, OK. He was born Aug. 5, 1927 in Cape Girardeau County near Gordonville. The son of the late Elmer and Ernestine Neusbaum Eggimann. He and Anna Lee Phillips were married Oct. 11, 1953 at Hanover Lutheran Church in Cape. She passed away on Oct. 31, 1997. Melvin grew up on a farm outside of Whitewater, he served in the Army during the Korean war. He came home and started farming before working for KFVS radio and TV and then Harris Truck and Trailer where he retired. He enjoyed vegetable gardening, woodworking, tool collecting and rock polishing. Melvin was a member of Trinity Lutheran Church in Cape the VFW post 3838 and American Legion post 63. Loving survivors include a daughter, Donna Decker (John) of Tulsa, two sons Keith (Deidre) Eggimann of Tulsa and Scott Eggimann of Portland, OR, two brothers Glen Eggimann of Jackson and Ray (Della) Eggimann of Florissant, MO along with nine grandchildren and two great-grandchildren. In addition to his parents and wife he was preceded by a brother Farrell Eggimann. Friends may call Sat. Dec. 1, from 11 am – 1 pm at McCombs Funeral Home in Cape Girardeau. Funeral service will be Sat. at 1 pm with Pastor Dan Maske officiating. Interment will follow in Cape County Memorial Park in Cape, with full military honors. Local arrangements by McCombs Funeral Home in Cape Girardeau.